Back when our friends Joe and Lisa had their wine store we were introduced to one of the special higher end wines that they carried. I had appreciated the fact they were trying to introduce higher end boutique wines. This one was introduced by their wine distributor Jesse. In addition to the Black Magic Shiraz, we were also introduced to a couple other Small Gully wines called the Concoction and The Formula. When we planned to drink it recently, I asked Lisa and she shot me an email since I didn’t know much about the Black Magic wine. Deep color depth and a garnet hue. The initial glass was very clear, but as we poured the wine we noticed that the final glass had a lot of sediment. So much that I dumped the last two or three sips. The aroma of the Shiraz was moderate and smelled middle-aged. I thought it smelled earthy and dirty with dark fruit and plum notes. It did initially have an alcohol nose. Dry and full-bodied. 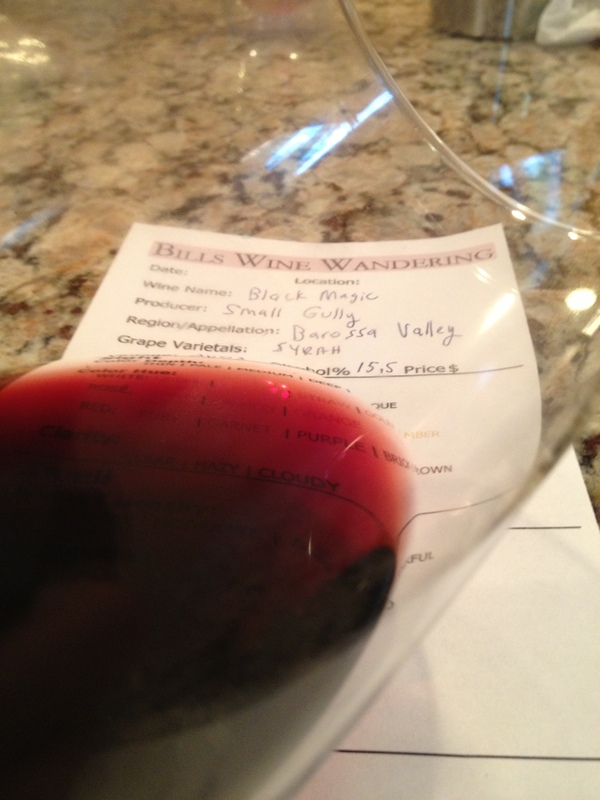 The acidity was lively making my mouth water with each sip with tannins that were medium and mostly soft. It was very flavorful and we could taste dark fruit, slight vanilla, and caramel. 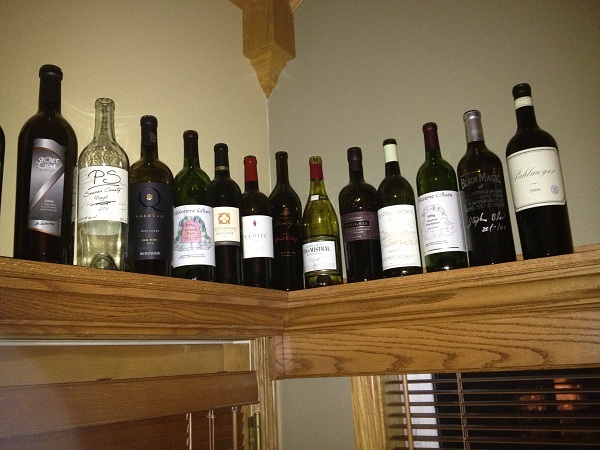 The Shiraz was showing its age and it had that “older wine taste” that I really love. The finish was long. How much: $100. And if I recall correctly, I think the bottle might have cost $10 more for the wine makers signature. 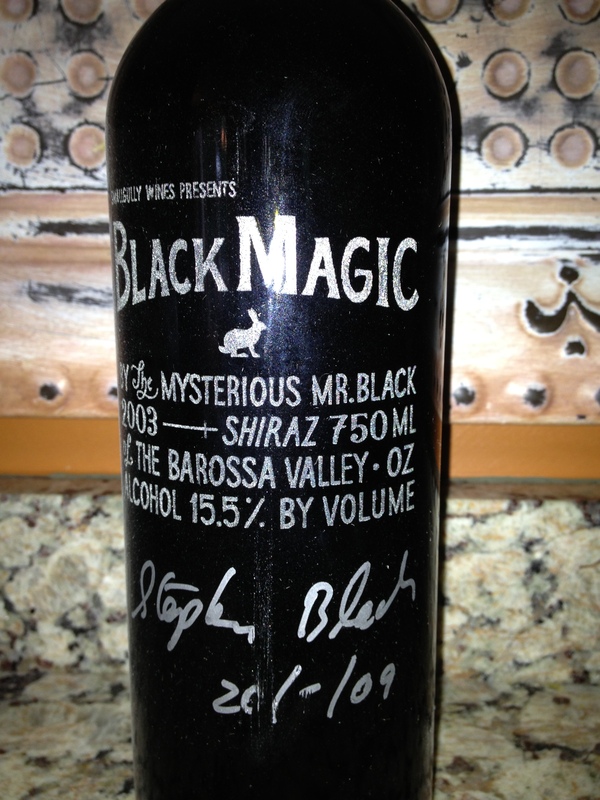 I rated the 2003 Black Magic Shiraz wine from Small Gully wines three glasses. When I finished the bottle on the second day it was still good! I have added the signed bottle to my “trophy” mantle.